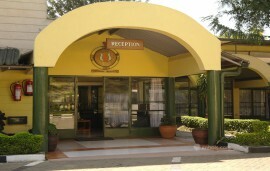 Sarova Lion Hill Game Lodge is located in Nakuru 2 hours drive from Nairobi. It lies along the Lion Hill overlooking the amazing Lake Nakuru which is famous for its vast bird life. The lodge fuses nature with contemporary bird feeds which attracts more than 50 bird species into the lodge making it a sanctuary for birds. Sarova Lion Hill Game Lodge is only one of two located inside the park that not only boasts thousands of flamingos on the lake’s shores but also houses the endangered black rhino, buffalo and antelopes. Accommodation at Sarova Lion Hill Game Lodge is in 67 luxury chalets all equipped with modern amenities. 64 of the chalets are standard rooms while 3 are suites with each chalet opening to a patio overlooking the lake. Room amenities provided in the lodge include en suite bathrooms with permanent showers and WC, razor/hairdryer outlets, beds with mosquito nets and tea/coffee making facilities. Of the three suites one is presidential and also ideal for honeymooners. The other two suites are beautifully furnished and equipped with fireplaces. Ziwa Suite Ziwa meaning “lake” in Swahili, is the lodge’s presidential suite. The suite is situated in an isolated location, ideal for honeymooners who want that required privacy. Chui Suite & Faru Suite Chui and Faru are Swahili names meaning “leopard” and “rhino” respectively. The 2 bedroom suites that are adjacent to each other are tastefully furnished with a fireplace and characterized by a lodge feel. Standard Rooms The 64 standard rooms are cozy and all have a panoramic view of the lake. There is an option of single, double or triple with some rooms having a day bed. 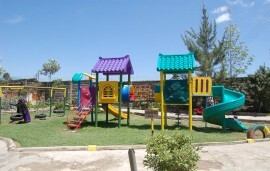 The hotel offers different activities to keep their guests entertained .Among others they include cultural performances, nature walks, tree planting, bird watching, archery and indoor games. 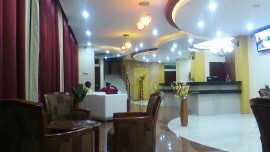 They also have a wellness centre where one can enjoy full body massage. 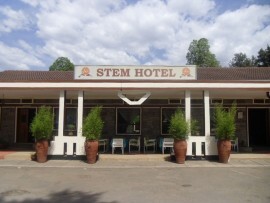 The hotel offers conference facilities that can be tailored to suit to the clients’ preference. The two conference rooms at Sarova Lion Hill Game Lodge have modernized equipment to match with current technological demands of business meetings. The facilities include WIFI, LCD Projector, TV and DVDs, flip chart board, markers and pens. The two halls can hold between 38-100 people in various sitting styles. The large manicured grounds are ideal for team building activities and for groups looking to hold their meetings outside.